COLORADO SPRINGS, Colo. (Sept. 15, 2016) — The Space Foundation is partnering with Project PoSSUM to offer the PoSSUM Academy upper-atmospheric and astronautics education program in 2017. The program, designed by upper atmospheric scientists and former NASA astronaut instructors, is an immersive education program for high-school and undergraduate students. PoSSUM Academy students learn about upper-atmospheric science and astronautics as they prepare for simulated suborbital missions to study elusive ‘space clouds’ called noctilucent clouds. 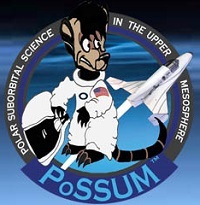 PoSSUM, an acronym for Polar Suborbital Science in the Upper Mesosphere, grew from a suborbital flight opportunity granted by NASA in 2012 in which a commercial suborbital spacecraft, such as Virgin Galactic’s Spaceship Two, will be used to fly through a noctilucent cloud with a package of instruments that can create a tomographic image of these cloud features, much like an MRI builds a 3D model of a human body. Combined with temperature and trace gas measurements, these data will be used to create extremely detailed models of our upper atmosphere, which will fundamentally address some critical questions, such as how energy and momentum are deposited and transferred through this region of our atmosphere. Three PoSSUM Academy classes will be offered in May 2017 at the Space Foundation Discovery Center in Colorado Springs. PoSSUM team members will install a suborbital flight simulation facility, mission control room and a spacesuit operations facility complete with donning room and pressurization facilities. The simulation will simulate flight profiles representative of several of the manned suborbital spacecraft in design, such as Virgin Galactic’s Spaceship Two and the XCOR Lynx vehicles. In addition to providing PoSSUM Academy courses, PoSSUM will lead the development of an interactive exhibit designed to educate Space Foundation visitors about upper atmosphere and provide an opportunity to experience a virtual reality flight onboard a NASA balloon that the PoSSUM team will launch over Antarctica in December 2017 to study fine details of noctilucent clouds. The education component of PoSSUM is what is particularly unique. The PoSSUM Academy program that the Space Foundation will host is based on the PoSSUM Scientist-Astronaut Program, a specialized program that has drawn scientists, engineers and educators from 24 countries in all six continents to the Embry-Riddle Aeronautical University in Daytona Beach, Fla.
Last April’s PoSSUM program brought NASA astronauts Dr. Don Pettit and Nicole Stott, who shared their experience observing these clouds from the International Space Station and communicating the science. At the Space Foundation, PoSSUM Academy students will learn how to use PoSSUM instrumentation to perform the unique PoSSUM Noctilucent Cloud Tomography mission, much like the PoSSUM Scientist-Astronaut Candidates do. To effectively perform simulated missions, PoSSUM Academy students need to learn a lot about the science behind the mission as well as practical skills such as spacesuit and camera system operations. Noctilucent clouds have always been an elusive subject to study; they only appear at high latitudes and during a window of roughly 50 days in the summertime. Suborbital PoSSUM missions are anticipated to start in July 2018. During this time, the spacecraft and its team would need to deploy to a high-latitude during a carefully-selected week in the summertime and wait. Then when a cloud is sighted, the crew must be prepared to launch. However, the next major step for PoSSUM will occur in Antarctica during December 2017. Together with Columbia University, PoSSUM team members will launch the NASA-funded high-altitude balloon experiment that will carry PoSSUM instrumentation high into the stratosphere for a two-week mission around the Antarctic polar vortex. And this October, the PoSSUM team will be further testing spacesuits and instruments in High-G and Zero-G conditions with the National Research Council of Canada in Ottawa, Ontario. PoSSUM Academy will be held at the Space Foundation Discovery Center for three weeks during May 2017, and is limited to a total of 24 students each week. An introductory rate of $1,750 is offered through Dec. 31, 2016, for interested students who register by Dec. 31. Applications will be accepted online at projectpossum.org/education/possum-academy. Project PoSSUM has been recognized as a Certified Space Educational program. Learn more about Space Certification by visiting www.spacefoundation.org/programs/space-certification. Project PoSSUM, an acronym for Polar Suborbital Science in the Upper Mesosphere, is a 501(c)(3) non-profit research and education organization that uses citizen-science astronautics to enable novel measurements of the most sensitive region of global climate while inspiring and educating the public on the critical roles this region plays to the overall understanding of our global climate through immersive educational programs, administered by PoSSUM team scientists at the Embry-Riddle Aeronautical University in Daytona Beach, Fla. To learn more about Project PoSSUM, visit www.projectpossum.org/. Founded in 1983, the Space Foundation is the foremost advocate for all sectors of space, and is a global, nonprofit leader in space awareness activities, educational programs and major industry events, including the annual Space Symposium, in support of its mission “to advance space-related endeavors to inspire, enable and propel humanity.” Space Foundation World Headquarters in Colorado Springs, Colo., USA, has a public Discovery Center, including El Pomar Space Gallery, Northrop Grumman Science Center featuring Science On a Sphere® and the Lockheed Martin Space Education Center. The Space Foundation has a Washington, D.C., office and field representatives in Houston and the Florida Space Coast. It publishes The Space Report: The Authoritative Guide to Global Space Activity, and through its Space CertificationTM and Space Technology Hall of Fame® programs, recognizes space-based innovations that have been adapted to improve life on Earth. Visit www.SpaceFoundation.org, follow us on Facebook, Instagram, LinkedIn, Pinterest, Twitter, Google+, Flickr and YouTube, and read our e-newsletter Space Watch. Rather than simulated they should just buy a couple flights from UP Aerospace and launch them from Poker Flats, AK.